How much can you earn from SponsoredReviews.com? Heck, I do this just for fun so please don’t throw rotten tomatoes at me. I submitted my personal blog to [tag]SponsoredReviews[/tag].com for evaluation and it says I can earn up to USD500 per post. Heh, I am not counting on that. Here’s the screenshot that shows pretty good figures. 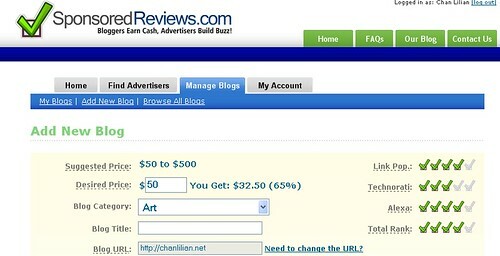 Since [tag]ReviewMe[/tag] is charging advertisers USD100 for a review on my personal site, I put the same figure as well. I categorised my personal blog under ‘Women’. Let’s see if I can actually get anyone to pick me. An influential blogger who can writes just about anything and get people to believe it. Try me. Hahahaha, don’t take what I wrote seriously, ok? After I submitted that, I realised the figure of USD100 is way too much for blog in the same categories. Ahh…never mind, let’s just say that I am Chinese and Chinese like to take risks and challenges. You never try, you never know. Let’s hope SponsoredReviews.com delivers. Cheers to making more money! wahau… i got ticks oni. so i put my price at 40 bucks. i mean 3 ticks oni. Still dont know how it works. I’ve sent in the bids and still waiting… what to do next? how do I know I’ve been approved? Before succesful bids no need to write review izzit?? samm – Heh, I got one. Nay, the next post. Enam ringgit lima puluh sen sahaja. ashotiwoth – This is rather good/bad ‘cos the advertisers evaluate us directly and hence, they get what they want. Good for them, nervous for me LOL. dragonmummy – They will mail you if they want you to write. I got mine today and due in seven days. Remember you need three posts in between. Phew…. Ahpek- Put mat-si dou mou yong…Mereka kasi sepuluh sahaja, kita dapat enam ringgit.